While we were putting plan B into action in one place, Jocelyn Sprouse was leading a trio at the wedding ceremony of Julie and Andrew at CJs Off the Square in Franklin. Julie and Andrew chose traditional wedding music for their prelude and ceremony with mothers coming into the ceremony area to Jesu, Joy of Man’s Desiring, the maids to Canon in D (we like this one because it’s so easy to come to a logical stop quickly. Makes us sound good. It’s all about us) and finally Julie arrived at the gazebo to Trumpet Voluntary. 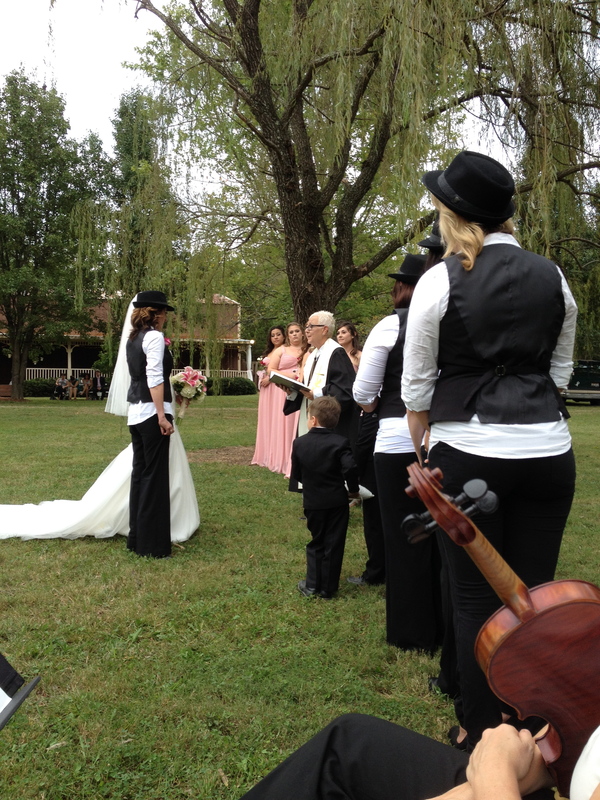 After the ceremony they all recessed to the Mendelssohn Wedding March in keeping with their other traditional choices. Mary Alice Sublett from StudioWed was the planner/coordinator for this wedding. Mary Alice is an immense pleasure to work with. She’s organized, kind, and doesn’t forget the musicians (see I told you it was about us). Many wishes to Julie and Andrew for a long and happy life together. Congratulations many times over! Richard and Ping were married at the home of the groom (now their home of course) on October 11. Their ceremony was made so much more special by having music composed by Richard’s son played for their prelude and entrances. I don’t know about the guests but we were very impressed with the beauty and creativity of the compositions. It was another day of rain that never managed to dampen the spirits of the wedding party and the guests. After the simple but sweet ceremony in tux and white gown, the bride and groom changed into gorgeous clothing reflecting Ping’s Chinese heritage for their reception. The quartet reconvened in the foyer of the home to play fun stuff for the reception that was piped all over the house and yard. We played “I Feel Good” as Richard and Ping entered the reception area. Our coordinator this time was Meredith Zeller of Sage Nines Event Production. She was amazing at keeping everything under control as the rain forced all their careful Plan A plans into Plan B. Many wishes for a long and happy married life to Richard and Ping. Congratulations! October 10th brought the union of Aimee and Hunter as well as a Noah’s Ark style deluge. Fortunately for all of us Aimee knew the object of the gathering was for her marriage to Hunter and everything else was detail. We originally were to be on the lawn in back of the mansion for the ceremony but the heavens changed that plan in a minute. They were married on the porch of the mansion under the covered area in the back. Sarah Willard of Music City Events was a rock throughout the whole time fielding, with total cool and patience, the questions and requests that came at her like the pounding drops of rain. We’re always grateful not to be forgotten in controlled chaos. Aimee and Hunter chose mostly hymns for their prelude, classics for their processionals and then gave their guests a taste of the party to come by recessing to Starlight by Muse. Their ceremony was sweet and made more intimate by having to squeeze everyone into a much smaller space. They definitely made lemonade out the lemons that day. The rain was soon forgotten as the party revved up. Soon they were dancing their first dance to “Lovers’ Waltz”. The guests were again reminded of the rain when it returned with a vengeance during the reception. We could hear the sirens going off in the distance warning of possible tornadoes. We continued to play as though we were on the Titanic as it was going down. Nothing awful happened thankfully and the rain had let up by the time the guests began to take their leave. Our mantra after such a wedding is “They’re married!” and so they were, rain or no rain. Congratulations to all! Blessings to the newly weds! At the rehearsal as the sun went down. Meanwhile in a more rustic setting Susan Mullen led a string quartet at the wedding of Kristen and Brent that took place at Samary Plantation. I only got to see pictures of the venue and wished I could have been there. Kristen and Brent chose mostly contemporary music for their wedding. Mothers did arrive at their places to Jesu, Joy of Man’s Desiring and Kristen chose the Canon in D for her entrance but other than that, the maids processed to Such Great Heights (Iron and Wine version) and at the completion of the ceremony everyone recessed to All You Need Is Love. During the ceremony the bride and groom’s friend, Steven, sang Leonard Cohen’s “Hallelujah” with the quartet accompanying. The words to this song are a little odd for a wedding but the tune is so moving you just have to go with it. Many wishes to Kristen, Brent and their families for a long and happy life together. We started off October with a wedding in the courtyard of the Schermerhorn Symphony Center. Jocelyn Sprouse and Gary Tussing made up the rest of the trio as we played traditional and contemporary music for the wedding of Jessi and Jeremy. Jessi and Jeremy opted to keep the music simple, seating the entire wedding party of mothers maids and groomsmen to the Feather Theme from Forrest Gump. The light and airy music fit the sunny, slightly breezy afternoon perfectly. Jessi made her entrance to Con Te Partiro, a beautiful, majestic Italian song made famous by Andrea Bocelli. As guests were seated they found little silver bells on their chairs which they were able to use during the ceremony to express their joy as Jessi and Jeremy made their way back down the aisle while we played All You Need Is Love. But before that happened, instead of a unity ceremony the mothers came forward to ring chimes to symbolize the union of the families. Bruce Pittman did a great job of coordinating this wedding. It makes the musicians’ job so much easier to have someone coordinating who knows what he’s doing. Congratulations are in order to Jessi and Jeremy and their families! And a wish for many happy years together. No, this wasn’t at a Western bar. 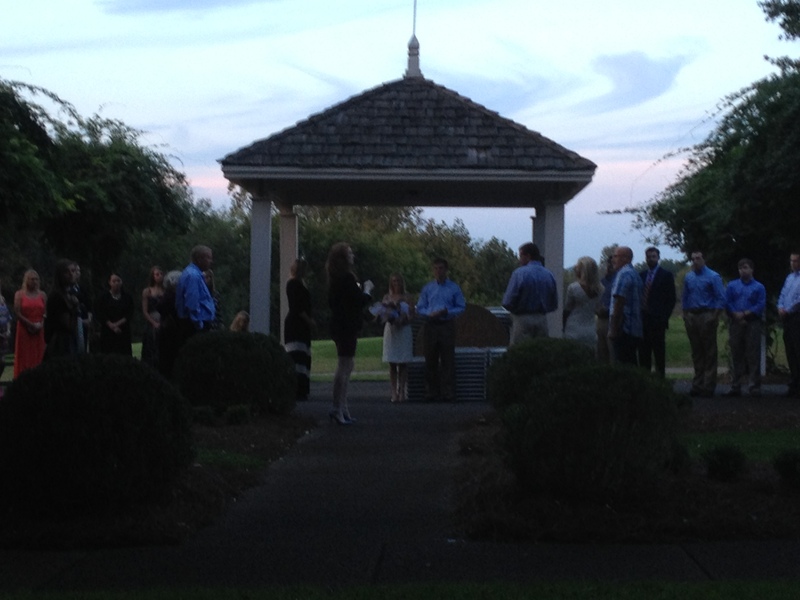 There is a relatively new wedding venue between Franklin and Murfreesboro that is a delightful, rustic place to hold a ceremony. For this wedding the bride’s mother, Ronda, became ordained to be able to conduct her own daughter’s wedding. She was fabulous. I would never in a million years have guessed she had never conducted a wedding before. Her son, Okey, was the one who contacted me about doing the wedding and such a big time talking to him over the phone that I really looked forward to meeting this family. Not only that, there turned out to be mutual connections that shrank the world to even smaller than it already was. Ronda works with a friend of mine in the nursing department at Cumberland U. But let me write a little about the wedding. Lauren married her sweetheart, Candice, in a very lovely ceremony for which Ronda brought a fresh look to the story of Ruth and Naomi. The music was traditional featuring Bach, Pachelbel and Purcell. Marsha Hancock and Stephen Webb had been invited to sing during the ceremony. Marsha sang Ave Maria after the Declaration of Intention and a Prayer by brother, Okey. Gorgeous. For the lighting of the unity candle both Marsha and Stephen performed The Prayer so wonderfully even we musicians, who have heard it so many times,were moved. Congratulations to Lauren, Candace and their families and wishes for a long and happy life together. When Craig Duncan and Gary Tussing finished at Scarritt on this day they dashed out past Gallatin to Rock Creek Farm to preside over the music for Cate and her sweetheart. I didn’t get to play this wedding because I was otherwise occupied at a wedding I’ll mention in another post. So I didn’t learn the name of Cate’s fiance. Cate was a pleasure to work and because master fiddler, Craig, was on the job, Cate got to recess to a wonderfully played rendition of Wagon Wheel. Cate later wrote how amazing the musicians were…but I already knew that. Congratulations to Cate, her sweetheart and their families! I’m only a month behind in my wedding reports. I plead busy. Last month about this time some of my guys lead by Craig Duncan were present at the nuptials of Julianne and Ben at Scarritt. They chose traditional classics for their prelude and ceremony, with mothers arriving to the Bach Air from the Suite in D, the maids to another Bach…Jesu, Joy of Man’s Desiring, while Julianne chose Trumpet Voluntary for her entrance. Ben and Julianne then recessed as husband and wife to the Mendelssohn Wedding March. If you make your way back to my website to the accolades page, you can read the wonderful thanks Julianne’s mom, Karen, wrote. Congratulations to all! I’d like to mention the wedding planner, Kathy Best of Front Porch Farms. Kathy is such a doll to work with. We know when we see her that all will go well and it surely did.